Note: this competition prize was gifted by Niederegger in return for this post. I love marzipan. Some of my earliest memories of the stuff involve the joy of tucking into beautifully crafted marzipan fruits around Christmas time…as well as peeling the thin layer of almond paste from a slice of Christmas cake and saving the best bit till last. It’s one of those confections that always reminds me of Christmas…but one that I’m equally happy to enjoy at any time of year! But did you know that most consumer marzipan is 50% almond paste, 50% sugar? I guess doing it that way keeps the costs down for both manufacturer and consumer…but it’s one of those things where you really do get what you pay for. According to local legend, marzipan was first created in Lübeck in north Germany…and by far the city’s best-known marzipan producer today is Niederegger. Most of the city’s marzipan producers use 70-90% marzipan paste and 10-30% sugar in their confections…at Niederegger, you can be sure that you’ll only be getting 100% marzipan. They’ve been going since 1806, when confectioner Johann Georg Niederegger first opened his independent confectionery in the city and created his Niederegger marzipan recipe. 16 years latest he acquired a new site on Breite Straβe, which remains the location of Café Niederegger today. And the brand grew and grew: supplying the court of the Russian Tsar, being awarded various medals, selling to the German emperor’s court…the secret recipe has been passed down from generation to generation, with the seventh and eighth generations now at the helm. Win a Niederegger Marzipan with Love Hamper! 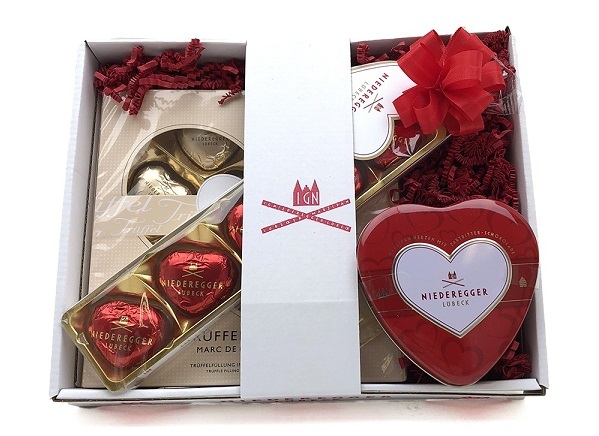 We’re offering one lucky Bristol Bites Instagram follower the chance to win a Niederegger Marzipan with Love hamper, worth £20! The hamper tray contains a Classic Marzipan Hearts stick pack (5 hearts), a Heart shaped tin filled with Classic Marzipan Hearts (6 hearts) and a 140g Marc De Champagne white chocolate truffle hearts (10 hearts). To enter, head over to my Instagram – all you need to do is follow me and @niederegger_uk, like the competition post and tag a friend! The competition closes at 12pm on Sunday, March 31st…good luck!